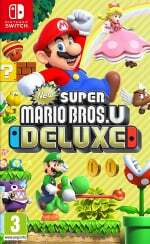 Yesterday saw the latest batch of UK chart data roll in, revealing that New Super Mario Bros. U Deluxe's launch on Nintendo Switch saw sales that were 24.8% higher than the original release on Wii U. As it happens, a chart tracking error means that this information was incorrect; instead, the results are even more impressive. 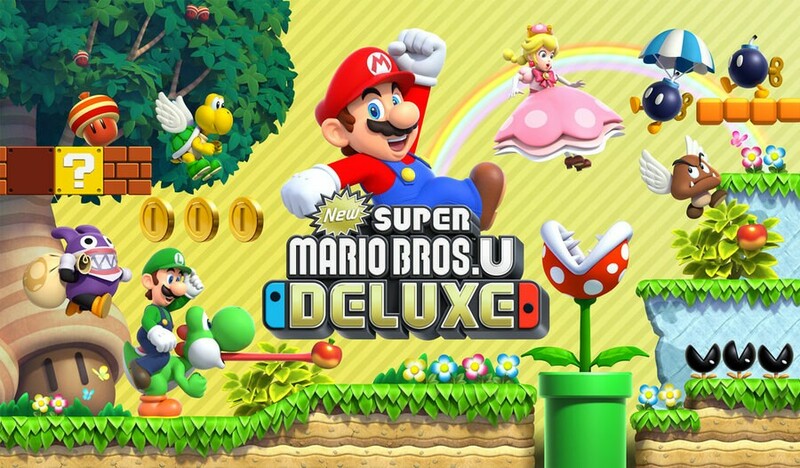 The new information, provided by UKIE, has revealed that the Switch Deluxe edition's sales were 56% higher than what New Super Mario Bros. U achieved on Wii U back in 2012. As ever with UK chart data, these statistics only take into account physical sales; were digital sales included too, we expect this gap might be even larger. While the number certainly seems impressive, and goes a long way to highlight how much demand there truly is for Wii U rereleases, it's worth noting that New Super Mario Bros. U arrived on Wii U as a launch title. Naturally, this means that the Wii U's install base was much smaller than that of the Switch at present, giving Switch a better chance of acquiring high software sales. We've updated our chart information for last week to account for these changes (the updated data also shows that Tales of Vesperia: Definitive Edition debuted in the top ten). If you're interested, you can view this updated chart info here. Have you picked up Mario's latest adventure? Are you surprised by the statistics? Tell us below. 'no one wants Wii U ports'. @Scottwood101 Said several people with no idea of the market or with their heads too far up their own nether-region. I'm surprised it isn't higher, I knew 26% was wrong. It was always gonna be over 50% higher. Super Mario 3D World Deluxe, imminent. Can’t wait! Would love a Wii Sports Club Deluxe with added sports, consisting of Basketball, and Ice Hockey. I don't know what the Wii U's initial sales were at launch (not great I'm sure) but I imagine most people who did get one picked this up as their launch game. So there's that to take into account too I suppose. @Scottwood101 I'd buy a Switch version of Mario Maker if it weren't for the awful Online 'service'. @SuperCharlie78 Where did 30 million install base come from? I didn't think Nintendo released any recent figures for the Switch? @FragRed It's probably near 35 million..
17 million form last year and this year it's tracking at about 18 million - If you follow these things via NPD figures and Media Create in Japan. @90sRetroGaming is Super Mario 3D World coming to the switch? I hadn't read that anywhere. I'd buy that and both Galaxy games if they were ported, I haven't played any of them yet. @MarioBrickLayer Eventually, it will, especially since Captain Toad is on the Switch. No way they’d bring that over, and not 3D World. Too much money to be left on the table. I was confused whether is was launch vs launch window or launch vs all time Wii u sales. Still not overly sure if I'm honest. The best 2D Mario game since Mario World finally gets its recognition. Switch closed last FY with 17,26 millions (iirc), then Nintendo said it sold 5 millions in the first 2 quarters (april 1st to september 30th 2018). Assuming the Switch sold around 10 millions in the 3rd quarter it should be sitting on 30-32 millions as we speak. @Gs69 are you sure this is the case? Maybe I'm an isolated case but the only big releases I have are Zelda, Odyssey, Smash, Xenoblade, Splatoon 2 and MK8. Everything else has been indie releases. I'm not pining for big releases, just new experiences. If that means it's a port then so be it. I've passed on Pokemon, Pokken, Dark Souls, Doom, Wolfenstein, Mario Tennis, Donkey Kong, Rabbids, Fifa, Arms, Skyrim. All big releases that apparently we all crave. Personally I am praying for Windwaker and Twilight Princess HD, Wonderful 101, and Mario Maker. Most people that purchase video games do NOT wait for the next big release. The majority of people that play games buy them as they come out. Vocal people on websites such as this are a very, very low portion of the sales figures. We are probably the only ones keeping track on release schedules and what to wait for next. And that really isn't saying much since NSMB U doesn't contain a trinket of magic, originality, imagination, memorable music and cutting edge graphics that SMB1, 2, 3 and world all contained during their releases. It's still fun and the core stage design is good stuff...it's just layered in awfully bland recycled generic simplified ugly barren empty plastic shiny wallpaper-like visuals, topped up off with an irritating lack luster low rent and again recycled soundtrack. All 4 games take place in the same boring universe and reuse each others assests. dejuvu aplenty! @Varkster I have opened a can of worms here and yes you are right about more casual buyers not bothering about sales figures and the like. What's next now? 3D World or Maker? One and a half at best, Luigi U is just a standalone expansion. Good for them. I'm not really interested in this, i played it to death already on the WiiU. Bought the original, Liked it. But I still feel Nintendo is lazy with these ports and remakes. Correction: No one wants ridiculously overpriced Wii U ports. 20 Dollars/Euros would have been a suitable price for this game. Yet everybody seems to celebrate Nintendo's price gouging. Its mario, or course it'll sell well. @WaveBoy . Couldn’t agree more!!! Did you read this Nintendo??? This is what we want!!!! Nintendo is a for profit company. Maybe because to the vast majority of people... it's not price gouging. It's an extremely high quality game most never played. Thus to most, it's brand new, and people have no problem paying $60 (and thanking Nintendo for the opportunity) if it's a high quality game of modern standards that's new to them, and which they dont have access to elsewhere. The majority has spoken, and the majority says not only is it not price gouging, it's a hell of a great deal. Just because a few sourpuss Ouya owners think every game from their failed system should launch on Switch with an orange clearance sticker, the rest of the world shakes their head and goes about their business. The rest of the normal world says it's a fair price (hence why they're buying it). So maybe it's time to stop regurgitating irrelevant minority opinions like facts. You dont dictate what a fair price is... you're not that important. The masses dictate what's fair. Every time someone here claims "its price gouging" another 10,000 people buy the game as satisfied consumers. While I got a Wii U at launch - this game wasn't what I chose. I went with the ZombiU bundle since it was the best value. I did pick up NSMBU last year and it's miles better than the Wii & 3DS "New" titles and should be picked up by people who own a Switch but never a Wii U. A good game sold much better on a much more popular console? Next you will be telling me that if I don't drink water it could negatively impact my health! Oh you silly British folk! Even better. Glad Nintendo didn’t leave money on the table. I’ll get it eventually. Yes, it's a great game. I hope they port more Wii U games in the future for those of us who didn't have a Wii U, such as Super Mario World 3D, Wonderful 101, Xenoblade Chronicles X and Super Mario Maker. Not surprising. The game is perfect handheld, and Switch has an install base already where WiiU sold poorly and this was a launch title. @JaxonH "A few sourpuss Ouya owners" Awww, that's harsh, man.....poor WiiU doesn't deserve that kind of verbal abuse. "The masses dictate what's fair." I agree with your post overall, except this part....the masses are morons that would gladly jump off a cliff if you told them utopia was at the bottom. Never trust the masses for logic or rational decision making, they look where they're told to look by "more important people." The masses will think game streaming is the cat's meow. Otherwise, in this case, it's not even about the people that never played the game. This game wanted to be on Switch from the day it was announced. Perfect handheld play game. Lack of real D-Pad aside. I certainly agree in general. By the time they had made it to NSMBU, they had played it too safe for too long with the "new" revival aesthetics and design methodology, which, by the way, generally do NOT reuse assets between games. Just the art direction is very similar and unoffensive, which makes it even more boring to think about. A proper Super Mario Bros. 5 (we can skip an official 4 here in the west, it's okay) would once more seek to reinvent the format. And it would be glorious if Nintendo invested an effort into this. I wonder if Takahashi and Miyamoto has it in them, but in case they don't, maybe some of their fresh faces do. There have been plenty, PLENTY of takes on how to expand the 2D platforming genre coming out of Nintendo since 1991, a fair few ending up so complex that regular people hardly knew how to play them anymore. With the 'new' series, Nintendo has stuck to a formular so simple everyone can join, and while I can't fault them for doing what works on a technical side, it could at least be allowed to look really fresh and cool while doing it. So which is it? Noone or everyone? Do we need yet another correction? Good god, not this again! Yes, we all know that the Switch has far outsold the Wii U. I'm happy about that. But it does get annoying having to repeatedly see articles about games selling better on Switch than Wii U, then acting like it's some amazing revelation. And since it's starting to look like they might actually port EVERYTHING: Please Nintendo, don't port Star Fox Zero! That game was awful, think of the children! Except you're not looking to the masses for "logic" or to make your decision for you. That's something else entirely. Glad to see so much demand for 3D World and Mario Maker out there. I've been more skeptical with these, especially since they both used gamepad features the Switch can't replicate. At the very least, a Mario Maker "player" that lets you access all the existing courses would be nice, but even better if they find the right way to port the creation tools. Fun Fact: NSMB DS has sold ~2 million copies LTD in the UK. Its launch week sales barely accounted for over 1% of its lifetime sales. I don’t agree with the price. However, at least Nintendo can use the money towards some new titles. Any success is better than failure. So it’s a double edged sword. Yep, this game is underrated. Mario Bros. U, imo, is the finest 2D Mario, followed by Mario Bros. Wii. Don't know if I'll double dip but Luigi U added to the package is a sweet deal. @SuperCharlie78 See, I'm not a fan of that way of thinking. "17 million people didn't have the chance to buy this game on Wii U." That's simply not true. Anyone who wanted to could have bought a Wii U and any game they wanted. Those 17 million people you discuss chose not to. Big difference. @JackEatsSparrows Just as easily could be "Waa, I want every game I purposely avoided for five years because I was too dumb to realize the Wii U was a different, better system, than the Wii." @Carnictis It's not an awesome reply. Quite honestly, it's petulant and childish to insult others who are feeling slighted by Nintendo. Wii U owners supported Nintendo through a real down period in it's history, and Nintendo basically spits in their face about it. Although from a business point of view it makes sense, for those who feel slighted or salty about it, it makes sense. Then you have guys come out and complain about that? @JackEatsSparrows The mentality is that Nintendo is focusing too much on ports and not enough on new games. Thus, Wii U owners have less to play. @JaxonH: I couldn't have phrased it better. Compared to some of the other Wii U ports, there's a lot of value wrapped up in the $60 NSMBUD release considering the original prices for both games. @teamdave2002 I mean, I was playing tons of games on my 360/X1 during the WiiU years. Because I went where I was entertained, not because I felt I needed to support one company or another. There’s plenty of new games on Switch for WiiU owners to play, though. @Obito_Sigma Yeah, I acknowledge the mentality exists. I just don’t agree. It’s not like we’re going from 32X to Saturn. The situation isn’t unique to Switch, either. X1 and PS4 had their fair share of ports in the beginning as well. It's just my humble opinion. Actually I don't know what to think about this game's sales (I like to watch at videogames sales, not that this is some vital stuff). The WiiU was such a failure most people didn't know about its existence, or they thought it was some Wii peripheral or the like. Switch is another beast entirely, just thnik about those 17 millions that didn't own a WiiU, I bet many, many of them just happened to know this game. Think of my 6 years old neighbour who just received a Switch for Christmas, it's a given he's gonna see this one at Gamestop and ask his father to buy it. No, he must know it now because of all the YT advertisement the game is receiving. His father will buy it gladly because of that Mario nostalgia. I bought it and played it on WiiU, just like the other re-releases I'm not interested, not at this price anyway. I will never understand why people believe buying a game for one system automatically entitles them to a cheap version of the game on a different system. Yeah if only the millions of people who haven’t played this before had refused to buy it. I bet they’d feel really virtuous. And the price point isn’t too high to anyone willing to pay it. Value is subjective. It’s a false comparison though. Ports don’t take anywhere near the same amount of time, resource and effort that new games do. Getting a port doesn’t mean it’s instead of a new game, it’s probably instead of nothing. @Scottwood101 Yeah the claims "Everyone who already wanted it bought it" never really made much sense to me. The 3DS equivalents in the same Mario series were selling 10 million+. New Super Mario Bros 2 released the same year and has done just under 13 million and still selling. It's kind of dubious that the demand for another game in the exact same series(one which is arguably better in quality) would really be sub 6 million without the consoles hardware sales being the constraining factor. I think the New series should be retired in favor of original 2d mario content. 56% is ok, but as already pointed out the Wii U version was released at launch time where installed units was around zero. So how good is 56% at two years into Switch’s life? Well, when you've already got a sizeable (and growing) install base with the Switch versus building one from scratch and launching with the Wii U, I imagine the numbers were bound to be higher anyway. If NSMBUDX consistently sells 56% more copies than NSMBU in all regions, it will sell 9.00 million units. @Gs69 Now is a good time to play it. It's fun. I played it heaps, nearly threw my controller at the TV with LuigiU but it's your classic Nintendo MARIO platformer. Graphically it's a bit meh.. but still fun none the less. I understand wanting to hold off, I wanted to buy Travis Strikes Again in a few days but sunk $70AU into this game instead. But I'm not disappointed. @sleepinglion haters gonna hate. There is a large audience for this game that has never played it. It’s a great game even if it was a launch title for a failed system. Too many people on here hating on Nintendo for offering their game to the new audience for retail price. I’m not sure if it’s the feeling of entitlement that has all you previous players scoffing at the price but for anyone that hasn’t played it’s a worthy purchase. Also explain how it’s a lazy port? For me that would be a port that didn’t run as good on the new system as the one it was ported from. I’ve played it on the Switch already and can confirm it is every bit as good as the Wii U version. Haters gonna hate. If people don’t want Wii U ports I’ll suggest they don’t buy them. Who didn't see that coming a mile away? Of course it's gonna sell more than the Wii U version. I picked the game up last Friday and am loving it. I had a Wii U but skipped it at the time, glad I finally got to pick it up now with 1080p visuals. With two main games to play through and 100%, plus an additional challenge mode, I think it was well worth the $50 I paid (price-matched my copy with Costco). Totally agree with the part about star fox. That game is offensive. I'm glad Deluxe is out but I'm not getting it. Personally i wished they remade the original New Super Mario Bros Wii that was on the Wii. The Wii version was so much fun. It had fun, had surprises and soul. The WiiU version was prettier and harder but was not as fun and feels a little soul-less. I dont know if that makes sense. @Scottwood101 It's becoming a shove ware machine unfortunately. I'm waiting on new fresh titles like Pikmin 4, Animal Crossing Switch. @BenGrimm If it's the same title with a couple of easily added, little value feature, then it should be less. This game should be $29.99. @sleepinglion Yes, I agree. It's a port. There's no more room for argument when "it's a port". The game should be $29.99 tops. Not saying it's a bad game, but it was already done before.....years ago. @Joe-b I mean... The Switch has a lot of the same bad titles every other platform (including Steam/PC) has. That doesn't make it a shovelware machine, just as it doesn't make the other platforms shovelware platforms. There are tons of quality games out, tons of quality games on the way, and tons of quality games that are ports. The Switch is a machine where, if you're not a moron, you can find hundreds of really good games to play. You know, like most other platforms. @sleepinglion well the game is the same price as it was at launch and they added a 20$ DLC to the mix. It’s a port not a remaster, not sure how that’s lazy. At the end of the day, it is good that Nintendo is making money that will keep them producing games, and that more people are getting to experience the game. Nintendo games are always overpriced, especially on the tail-end. For me personally, it is just another reason that I haven't hit the point where there is enough on Switch to compel me to purchase one. For all of the flaws of the console, the Wii U still does what I need it to do and there amazingly are still games (Wii/Wii U/eShop) I am discovering for it. The article really isn't much more than click-bait as it is not really an Apples to Apples comparison. It is like touting DVD sales numbers for the original Star Wars vs the LaserDisc sales numbers. I agree it should be a bit cheaper than a new game but not because a person owned it before on another console. @Blizzia yes there's a ton. I love it! @Scottwood101 ironically, this will only further cement Nintendo's approach of reselling the same stuff over and over again. Glad switch owners that didn't play this game the first time around are enjoying it though. @sleepinglion through the eyes of someone that has already purchased and played it once I get you.. millions have not. Keep in mind Nintendo is in business to make money. They clearly know what the hell they are doing as they are making bank. If you don’t like it vote with your wallet. @sleepinglion The original game launched with just NSMBU for $60. This package comes with the original game and New Super Luigi U, with new playable characters. That's not really lazy, nor is that "little to no content". @1UP_MARIO What qualifies as "new" to you? @WaveBoy Seems like you don't really want a good 2D platformer, you just want nostalgia-pandering. Change for the sake of change isn't very good. The aesthetics are not a good reason to dislike a game, and changing the game to 2D sprites isn't going to do favors for Mario. @Vriess No price gauging in re-releasing a game with extra features. You are acting entitled. @Dog a “new” super Mario game without the “new” in the title. New mechanics, new power ups, new themes and music. Kind of like how they went from super Mario Bros 3 to super Mario world. @RickD Define what "original 2D Mario content" is, please. Does it pertain to anything with the gameplay? @1UP_MARIO They did that with every NSMB game. New features, new mechanics, new music, etc. I'm not sure if you know what you're looking for in a 2D Mario game. They are so fond of this news on this site that they HAD to make a extra article...while they already had updated the original article. Overkill much? !